The chest sizes listed in the chart below are from Klim’s chart and I’ve double checked the actual jackets against the chart and it is accurate. But be careful… while the size Large is exactly what you’d expect with a 44” max chest, the smaller sizes are a bit smaller than normal and the bigger sizes are bigger than normal. For example, a men’s size Medium usually is styled with a 42” max chest and Klim’s medium is a 40” max chest. Same goes for larger sizes… an XXL is typically a 48” max chest, but Klim’s is a 52” max chest. Given the variation from “normal” for smaller and larger sizes, I’d highly recommend you measure yourself and/or measure a jacket that fits you well (take the link below on how to do that). Then choose a jacket that is big enough for your chest. The Revener for 2018 is part of Klim’s 626 collections. What 626 signifies, I’m not sure exactly since they only describe the collection in non-specific terms, but here my take: The garments have many of the classic Klim features such as D3O armor, but with more subtle.. perhaps even retro styling. We sell a lot of REVIT and Alpinestars gear too, and jackets with styling like this are part of their “city” collections which mean they are a bit more tailored and make to look like city clothes rather than moto-specific jackets. That is what this Revener reminds me of. The shell of this jacket is a monotone of Cordura 500D which is quite sturdy and completely capable for the shell of a motorcycle jacket. And this shell is WAY above most since it has a bonded GoreTex layer on the back side. Construction like this doesn’t rely on separate or removable liners to make it waterproof, but rather the shell is permanently made that way. This type of construction is superior to those with separate liners and they breath about as well as anything you’ll find. This type of construction is relatively expensive but worth it to those who value the performance. 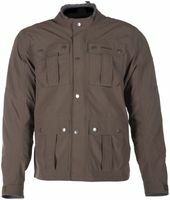 To get some airflow through the jacket in warmer weather, this jacket has two side torso vents and two back vents. Those vents allow direct access through the shell. The vents aren’t front facing so they won’t grab tons of air, but they’ll give you some, and the rear vents will help prevent inflation of the jacket should you leave the front zip down some. As with all Klim jackets, they leave it to you to wear undergarments to suit the conditions in cold weather, say layer up! With this jacket, you get a full set of D3O level one armor… all removable, shoulders, elbows and back. The D3O is standard issue for Klim and many other brands we sell such as Icon. Its good stuff and comfortable to wear.